It’s officially 2015 and what a strange winter we’re having so far! For a Maine winter we’ve had very little accumulation but the storms we have experienced have been slushy, slippery and down right dangerous. Slick roads can make for a scary commute and let’s face it, in Maine, it’s a rare occurrence when we shut down our work places and businesses for weather. Mainah’s know how to drive in the snow! 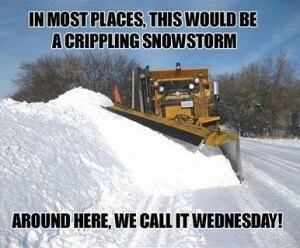 While we all joke about how the rest of the country is crippled by a dusting and our great state can trudge through two feet of the white powder with ease, we have to remember how we get all this stuff out of the way and keep things moving here in the North. PLOWING, SANDING AND SALT! At Dearborn Brothers Construction we do a lot of commercial plowing and snow removal for local businesses to keep everyone busy during months when typical construction projects aren’t plentiful. That means a lot of odd hours, long nights, and a lot of salt. Dearborn Brothers Construction has bulk salt available for contractors to purchase when they need it. Many landscapers and smaller businesses also make a living plowing and salting during the winter months, and for the past few years we’ve been providing salt by the cubic yard at our shop here in Buxton! It’s convenient for other contractors who don’t own large trucks and don’t need massive quantities for smaller areas and sidewalks, and we keep a steady supply for our own sites to be sure that safety is our first and foremost priority for customers and employees of area businesses who are depending on us to keep things running smoothly. So if you’re looking for someone to clear a parking lot, haul snow away from a site, or you’re just looking for some salt for your own projects we like to think of ourselves as a one stop shopping experience for both other contractors and consumers alike. Commercial plowing, snow removal, salt, sand, we do it all, and we have years of experience and a fleet of well oiled machines to make sure you make it to your destination! Labor Day has come and gone and the long, hot, humid days of summer now seem like a distant memory. Monday (September 22), marks the first day of Autumn, and you can already feel that familiar chill in the morning air. Some of the trees are even starting to show colors in their leaves. Try as we might, we can’t escape the fact that fall is here, and winter won’t be far behind. 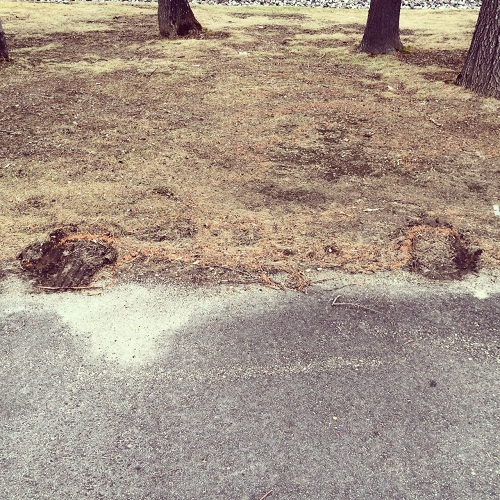 Have you been putting off that project in your yard, or waiting until the summer heat subsides to fix the holes in your driveway? Well, there is no better time than the present to take care of these things before the ground freezes and we’re faced with another Maine winter. 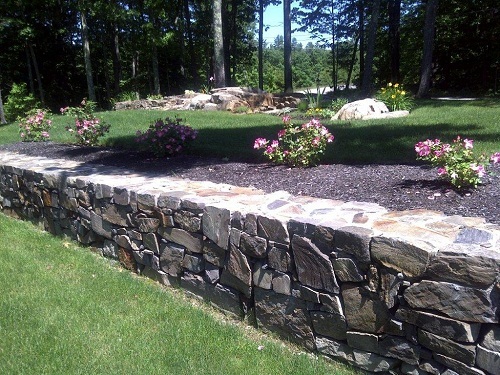 Dearborn Brothers Construction can supply you with all the sand, gravel, reclaim, loam, and numerous varieties of crushed stone you’ll need to take care of those last minute improvement and maintenance projects. We deliver to most areas in southern Cumberland and northern York Counties, but if you only need a small quantity, we can load material onto your vehicle at several of our facilities. It’s not too late to get your projects finished before the snow flies, but don’t wait too much longer. In the time it took you to read this blog, the first winter storm just got about 30 seconds closer. The many seasons of Maine! Many residents of the State of Maine will tell you that we have four seasons: Winter, Almost Winter, Mud Season, and Road Construction Season. If that is the case, then Road Construction Season is Dearborn Brothers Construction’s favorite season. 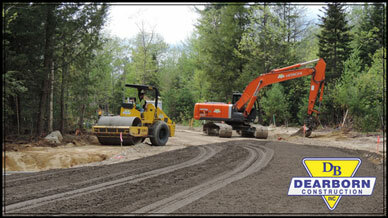 All joking aside, road construction is one aspect of the excavation industry that Dearborn Brothers excels in. We specialize in building new roads for residential subdivisions, as well as reconstruction and rehabilitation of major highways throughout southern and central Maine. We’ve been building roads and reconstructing highways since the mid 1980’s, and our philosophy has not changed since day one: Do the job right, and treat the customer fairly. With a vastly experienced crew and a fleet of the most up to date modern equipment, Dearborn Brothers Construction can satisfy all of your road construction needs. Whether it’s a small residential driveway or a major highway, Dearborn Brothers Construction can handle it. We also work in Winter, Almost Winter, and Mud Season! STONE IS ARMOR GRAVEL… GRAVEL CONTAINS STONE AND SAND…SAND CONTAINS STONE… IS THAT TOPSOIL OR LOAM?..WHAT ABOUT PEA STONE? ARE YOU CONFUSED YET? (SERIOUSLY FOLKS…IT’S ALL JUST DIRT)! Quite often we receive calls from homeowners who need aggregate material for their property, but they are unsure about what material will best suit their needs. To make matters worse, there are many different names for the various products that companies sell. For example, loam may also be referred to as topsoil (or “loom”, depending on whom you are talking to). In other parts of the US, crushed stone is called gravel. Crushed 3/8-inch stone is sometimes called pea stone or pea gravel, and 3-inch to 6-inch stone is sometimes called rip-rap or armor gravel. If you don’t deal with these products every day, the terminology can be very confusing. You also want to be sure that the material that you are ordering is going to be the right material for your needs. The last thing you need is to get a load of 6-inch stone delivered to your house to fill in the potholes in your driveway! 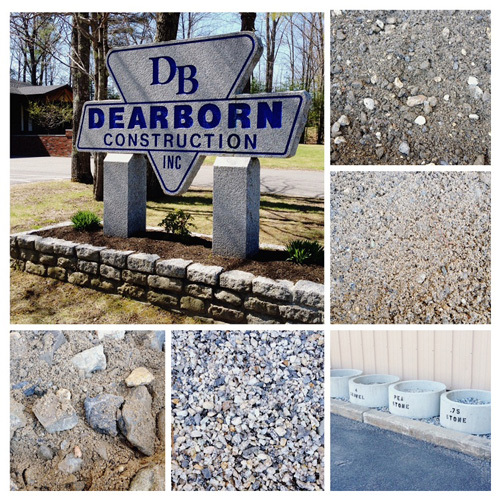 Dearborn Construction can help you navigate through the vast jungle of aggregate materials. Our staff is extremely knowledgeable about the different materials that we carry, and we are always ready to answer your questions about the materials you need. We even have a selection of samples at our office displaying many of the common materials that we sell to give you a visual idea of what you might need, or you can visit our pit locations in Waterboro, (open year-round Monday through Friday), and Buxton (by appointment) to view our entire selection of aggregate materials. Deliveries are available in Waterboro, Hollis, Buxton, Dayton, Gorham, Saco, Biddeford, Scarborough, and many other locations throughout southern Maine. Our office is open from 6:00 a.m. to 5:00 p.m. Monday through Friday to assist you. 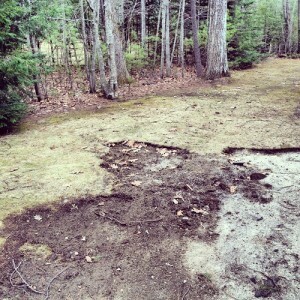 Did winter wreak havoc on your lawn? Now that the snow has finally melted, it’s time to take a good look at your lawn. Does it look like this? Winter can be brutal on lawns. Snow plows and vehicle tires can destroy the lawn that you’ve worked so hard to grow. You may have also experienced erosion issues, where the spring rains have washed away the soft topsoil before it has had a chance to dry out and solidify. Or maybe you finished building your dream home late last year and now you need to think about planting your lawn and garden. Whatever the reason, spring is the perfect time for cultivating. We’ve got screened loam available now for planting your new lawn, repairing winter’s damages, or starting a garden that you can enjoy throughout the summer and fall. 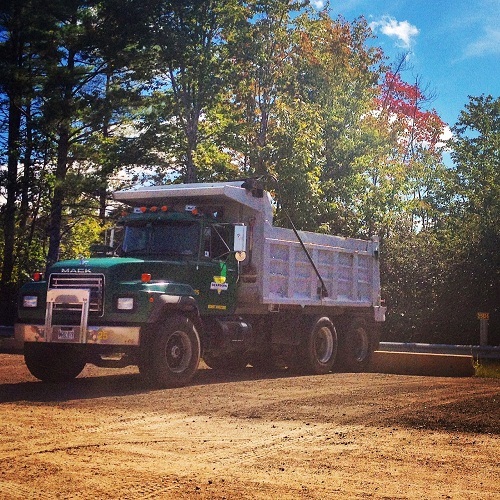 We offer delivery services for all of our aggregate materials, or you can stop by any of our pit locations and we will load materials onto your truck or trailer. (Please see the aggregate section of our site for hours and delivery options). 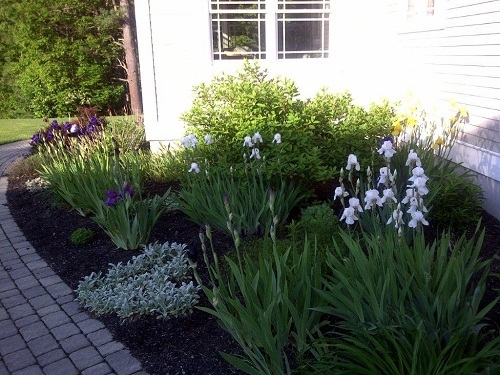 With Dearborn Construction’s screened loam, proper seeding and watering, and a good maintenance program, your yard could look like this!